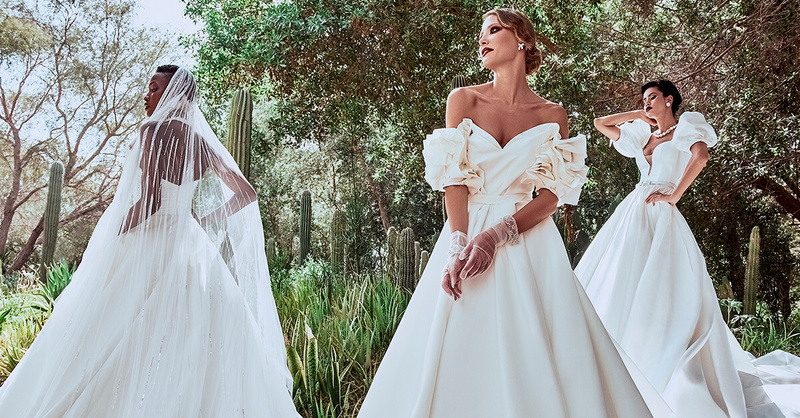 In a word, the 2019 Esposa Bridal Collection represents noble grandeur. In pictures, it defies the scope of any bridal craftsmanship by redefining the enchanting. Shot in what once was a Lebanese icon of noblesse itself, the Grand Sofar Hotel, the sublime voluminous wedding dresses add magic to an undeniable charm of abandoned heritage. Distinguished by their dreamy and imposing majestic ball gowns and long trains, the monumental bridal dresses exhibit embroidery art and shiny beading in ways that render classic cuts ever more elegant and unique. Heavenly beaded heart-shaped bodices, sensual off-the-shoulders, royal illusion lace work, floral embroidery, and an aristocratic touch of sparkling silver unite to make the Esposa 2019 collection worth of queens. The breathtaking ball gown masterpieces look like they’re destined to make history in the world of majestic bridal couture and await to awe the sophisticated at Esposa Dbayeh and Ramleh al Bayda branches in Lebanon, as well as Esposa new store in Dubai.